Essential oil diffusers are devices that are used to disperse essential oils (highly concentrated extracts from flowers, leaves, and other plant parts) into the surrounding air. According to the ancient practice of aromatherapy, spreading the scent through the air allows the essential oils to activate smell receptors in your nose, sending messages to the brain and influencing your emotions and nervous system. A ceramic diffuser allows oils to evaporate and disperse into the air. A drop or two of essential oil can be placed onto the terra cotta or ceramic diffuser. These diffusers are good for personal use in a small area, but may not be ideal for large or outdoor areas. 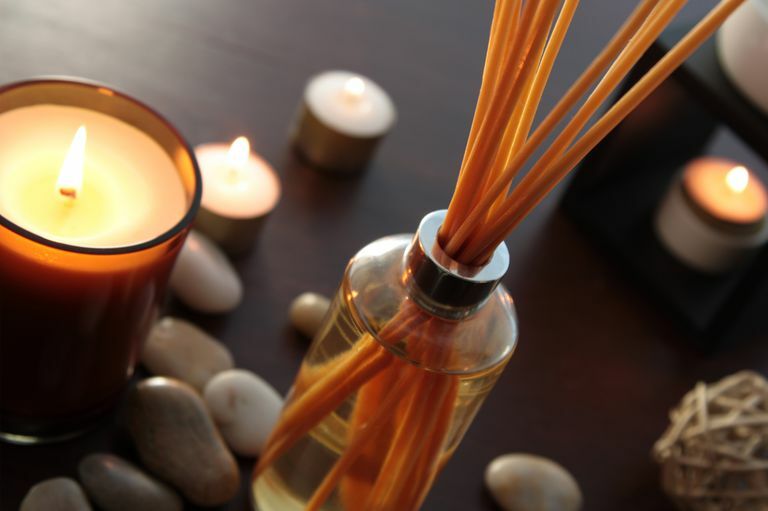 Reed diffusers often use rattan sticks, which have small channels that allow the essential oil to travel up the stick and scent the room. Lighter oils (e.g. bergamot, grapefruit, or lemon essential oil) tend to diffuse faster than the heavier oils (base notes) such as patchouli and sandalwood essential oil. Like ceramic and reed diffusers, electric fan diffusers expose essential oils to air without heat. Drops of the essential oil are added to a pad or to water. An electric fan in the diffuser blows air at the pad or water, causing the oils to disperse into the air. These diffusers heat the essential oil using the heat of a candle to promote diffusion throughout the room. Heat diffusers are a relatively inexpensive option for making a space smell nice, but they are not optimal when the therapeutic properties of the essential oil are desired as heat can change the chemical properties of the oil. Lamp rings, electric heat diffusers, and steam inhalation are other types of diffusers that use heat. Nebulizer diffusers break the essential oils into tiny molecules before dispersing them into the room. These devices have motors and a glass cylinder or bottle. The smaller molecules are said to be more easily absorbed, increasing the therapeutic benefits. Nebulizer diffusers can be more difficult to clean than other types of diffusers and the glass containers can be expensive to replace if broken. Nebulizer diffusers may not be suitable for certain situations due to the noise level of some devices. Ultrasonic diffusers use electronic frequencies to create vibrations in water which creates a fine mist of water and essential oils that is released into the air. Since it uses water, some people use them in the winter to help humidify dry air. Some ultrasonic diffusers turn off automatically to control the amount of essential oil that gets dispersed into the air. They tend to be less expensive than nebulizer diffusers and more sturdy. There are a variety of methods for getting the benefits of essential oils. Whatever product you choose, look for pure essential oils, avoiding artificial scents. In addition to diffusers, other ways to enjoy the scent of essential oils include room sprays, baths, aromatherapy massage, and scented body products. When you use essential oils at home, it's important to know how to safely use these powerful oils. Essential oils are highly potent. If you're going to use a diffuser, you shouldn't use it for prolonged time periods. If you have a health condition or are pregnant, check with your healthcare provider before using essential oils.